It is that time again, folks! The State fair has rolled into town, and they have quite the line-up this year. 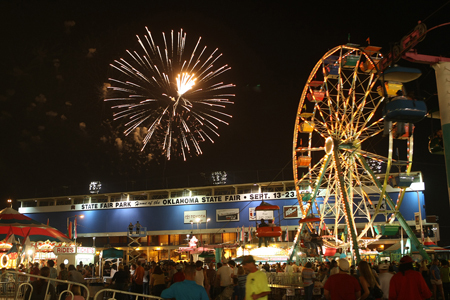 This past Thursday the 12th kicked off the whole shebang with the Oklahoma State Fair Opening Ceremonies at 5:00 p.m. Opening day was a $2 admission, and the gates officially opened at 8:00 a.m. Any other day however, it is $9 for adults. At 10:00 a.m. the buildings and exhibits open, followed by the carnival rides opening at 1:00 p.m. Every thing closes around 10:30 p.m. Also, there are tons of free parking on both the north and south sides of the property. However if you want a good spot, it is going to be $5 to $10 dollars on 10th Street, Reno Ave. and May Ave. The good thing about the fair is that there is always something to do, see or eat. This year there are some neat shows, like Disney on Ice and Xtreme Bulls, both of which are two of my favorites. There are concerts that will be showing, like Eli Young Band and Clay Walker. Among concerts and shows, there will also be pageants and other competitions including equine, livestock, creative, band day and, drum roll please, … arm wrestling! Not to be overshadowed by what can only be assumed as intense displays of manliness, there is also a lot of shopping. Anything can be bought or sold at the fair. From art and photography to health and beauty, you are sure to find anything to suit your needs. Some of the other more popular things to do are to go on rides, play carnival games and, my personal favorite: eat questionable food. The State Fair proves that most everything that will sit still can and will be fried. Not only is it bad for you, but also it tastes delicious. Try the fried snickers; they are amazing. But not you gluten-free, vegans, or vegetarians, you should avoid this area like the plague. Do not even think about it. Of course, there are also the things you do not have to pay for that are enjoyable at the Fair. For instance, one of Mackenzie Smith’s favorite things to do at the fair is to people watch. “I really enjoy seeing all the different type of people that come to the fair. It’s just a place that most everyone enjoys and can find something fun to do,” she said. State fairs are always an exciting part of your average American’s life. It brings some change and entertainment to the monotony of everyday school and work that helps us not feel so bored. For some, it is a chance to splurge on food that could put you in the emergency room. For others, the excitement of the cowboy shows attract you. Either way, the Fair can be described as entertainment for the whole family, even that part of the family you would prefer not to acknowledge.